Engage. 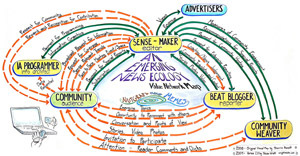 There's something for everyone in the emerging media landscape. Take a course in media literacy. Or teach one. Email was still the primary vehicle of choice for responding, though Facebook also brought some comments. Jane Stevens, Founder, editor of ACEsTooHigh.com, offered the example of WellCommons, Lawrence Journal-World’s local social journalism health site. I’ll be saying more about the award-winning WellCommons in the next post in this series. So stay tuned! This blog was originally posted on the Journalism That Matters site. It is reposted here in its original form and with permission.